Although the sponsorship deal gives Budweiser beer monopoly for the beer ads related to the World Cup, other brands were around. See our selection of the most creative beer ads that circulated around the World Cup in Brazil. Created by Anomaly agency, Rise as One campaign promotes new golden bottles of Budweiser beer and its sponsorship of 2014 FIFA World Cup in Brazil. Campaign is based mostly on video content, with two main spots shot in black and white by Garth Davis. Together with the spots, Budweiser produced a documentary series, also titled Rise as One and describing football as a social change factor. The campaign is supported in social media (YouTube, Facebook , Twitter, Instagram) and has its own web presence. Cerveja Foca could not refer to the World Cup, so it has started its campaign early on in May 2014. With tongue in cheek approach, this ambush campaign legalizes what was always true for many Brazilians. The Football is Brazilian religion. 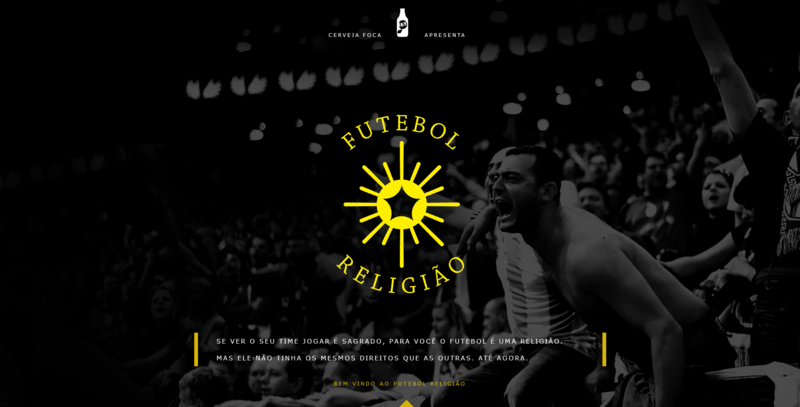 Using Brazilian law on freedom of religion it allows Foca customers and football fans to register into religion and celebrate selected matches as a religious mystery, being legally off work. The campaign credits go to Grey Brazil and its Creative Director Daniel Pérez Pallares. Campaign consists of the video spot, a website and a Facebook app. Brahma is a local brand of Anheuser-Busch InBev in Brazil. It is the official sponsor of the Brazilian soccer team, and the official beer of the World Cup. For the 2014 World Cup it has created a limited edition of 2014 numbered bottles made from the barley that has grown in the field adjacent to the Brazilian National Team Training Center, Granja Comary. The coach of the team, Luiz Felipe Scolari, as the brand ambassador gives his signature on the bottles. The campaign consisting of the 30 seconds TV spot, a website, printed ads and POS merchandising has been created by the brazilian agency Africa, led by its Chief Creative Officer Sergio Gordilho. For non-U.S. citizens this spot is ridiculous, for fans of the USMNT most probably it was great and encouraging. Belgium has won 2:1 and we have heard stories about boycott of Stella Artois in some american pubs, but we kindly remind beer lovers, that both brands belong to the same Anheuser-Busch InBev company. This all-american spot with Harleys, F-16’s and Cadillacs was produced by HSI and directed by Samuel Bayer. Here you can see the full version with all the hype items included. Made rather for 4th of July than for the World Cup, this Guinness ad is very powerful and reminds the brand tagline “The choices we make reveal the true nature of our character.” There are sports events in the cadre, but the frozen glass of Guinness waits for the bartenders real hero – a soldier who finally gets back to claim it. It really is #MadeofMore. Hats off for the geniuses from the BBDO NY and director Noam Murro, who once again took our emotions working with Guinness brand. #5 from Guinness should be #1, hands down. Thanks to all who can’t be there to enjoy the simple pleasures like watching the World Cup with family and friends.